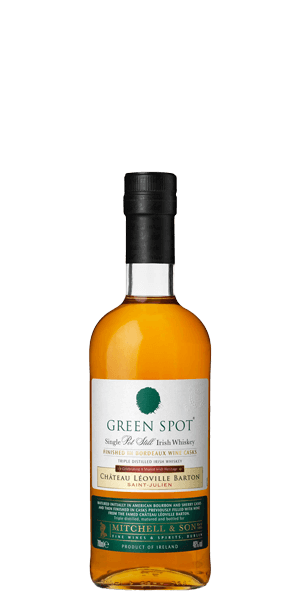 Everything you love about Green Spot Irish Whiskey, but more. Mitchel & Son started as a bakery and pastry shop in Dublin back in 1805. By 1887 they had expanded into Wine imports. And since they imported wine by the barrel, once they bottled the Wine, it was natural for them to get into the business of aging Whiskey. It’s a complicated arrangement — Midleton Distillery does their distilling, but they do their everything else. This includes purchasing the finest casks, aging, vatting, and so on under the Irish Distillers nameplate — a division of industry giant Pernod Ricard. When you are crafting a Whiskey, everything matters. But the magic is in the wood itself. There is something ethereal — almost mystical — about the interaction of Whiskey and the barrel. Green Spot Château Léoville Barton is an experiment in wood gone well. It begins as classic Green Spot, aged in ex-Oloroso Sherry casks. Château Léoville Barton is a prestigious wine maker in Bordeaux whose founder was — fittingly — of Irish heritage. And this fine dram is the first pot-stilled, Irish Single Malt to be finished in casks used to age their finest vintages. Originally there was a range of “Spot” Whiskies — identified by a blob of colored paint on the barrel. There was 7-year old Blue Spot, 12 year old Yellow Spot, and 15 year old Red Spot. But 10 year old Green Spot was the most popular and the only one to remain in continuous production. What does Green Spot Château Léoville Barton taste like? The Flavor Spiral™ shows the most common flavors that you'll taste in Green Spot Château Léoville Barton and gives you a chance to have a taste of it before actually tasting it. Raspberry, ginger root, shortbread biscuits, tart green apple. More apples with muddling spices, toffee, and lemon curd. Long and dry with granola and a dash of white pepper. Lots of complex flavors, but really smooth too. Apple, caramel, and spice up front with s dry citrus finish make this a real treat. If Barry White was drinking Irish whiskey, this is what he would drink. Deep and smooth. Awwwwww yeaaaah.